Don’t believe there are pyramids and other ancient structures in Bosnia? Why not come see them with your own eyes? As the new age of information widens our worldview, we discover that pyramids are not an intrinsic component of Egypt, but instead are spread throughout the entire world. Be them submerged, covered by dense vegetation, or simply laying in plain sight, these megalithic monuments seem to have formed in ancient times a global network which held various functions and utilities. When i first heard of the pyramid in Europe, topping the largest in Egypt by over 70 meters, I immediately searched google to see what the rumors were all about. The ‘Bosnian Pyramid of the Sun,’ as it has been dubbed, looked like an enormous hill covered by vegetation, with straight edges and a conical shape that truly resembled the classical form of a pyramid. But that was not all, as further claims spoke of more hill-like structures with pyramid features believed to have been made artificially. ‘Pyramid of love’ joined the tallest pyramid structurally, and then there was the ‘Pyramid of the Moon’ with its perfectly balanced, 45 degrees edges. Close by was the so-called ‘Pyramid of the Dragon,’ another structure with inexplicable features called the ‘Temple of Mother Earth,’ and very unnatural mound known as Osijela Hill. Together they formed the Valley of Pyramids in Bosnia and Herzegovina. It looked extremely promising on screen. However, numerous mainstream archaeologists opposed this megalithic discovery and even referred to it as a cruel hoax, or as part of a psudoarchaeological project, which meant it was not attested nor real. If this is enough to comfort a dogmatic individual that has put lots of trust in prestigious institutions to deliver accurate information without the need to further process it, for the open-minded folks, such a contradiction would only trigger curiosity and a desire to investigate on their own. 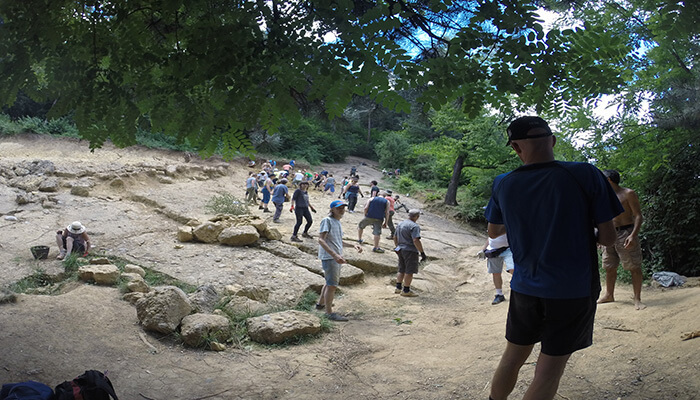 Since the excavation project allowed everyone to volunteer at the sites and personally contribute to uncovering these supposed timeworn pyramids, i decided to have a go and see with my own eyes what was really out there. The Bosnian outskirts still wore scars from the war during the 90s. It was unusually hot for a mountainous area, but i put that on behalf of the Mediterranean climate. I have reached Visoko near midnight, after a 24 hours drive. A hotel from the center proudly wore the logo of the pyramid, translated in Bosnian as ‘Pyramida Sunca’. 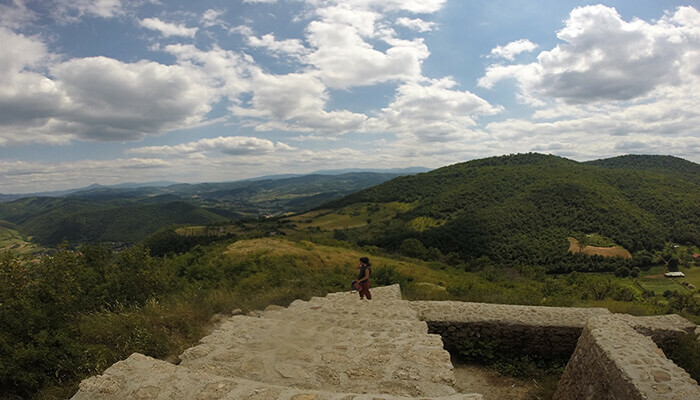 Since time immemorial, the pyramid of the sun, also known after its previous name as Visočica hill, towered over the small city of Visoko, which during the middle ages used to be the seat of the royal family. When dawn broke, i began trekking towards the top of the pyramid that could now be observed in its full glory. The road took me to a point where no shapes could be distinguished, only the grandeur of the city seen from above, with the Fojnica river crossing and splitting it in half. After a one hour climb, i came close to my final destination – a green plateau connected with undulating hills that stretched as far as the eye could see. A guy selling hand-made souvenirs gave me a final hint at where the top of the pyramid was, and i was surprised to see the remains of an ancient fortification just there. Nothing of sorts appeared on the brochures. The vegetation there was scarce down to the middle of the pyramid’s body. From there on out was a dense forest growing until the bottom of the “hill.” Reaching the very top offered a great perspective of things, and i felt my mood starting to improve, as if a flow of unknown energy crossed right through me. The next place I explored was Ravne tunnel, an underground labyrinth with narrow corridors stretching in all directions, and spanning 2.5 kilometers (1.55 miles) before meeting the Sun pyramid. The maze is believed to have been influenced by at least two different civilizations, one that had built it tens of thousands of years back, and another that had deliberately covered the entrances with soft, brownish colored filling material about 4,500 years ago. There is a constant airflow and a substantial level of oxygen present inside the Ravne tunnel, no matter how far you would venture inside. This is due to the ventilation holes present along some of the corridors. Ceramic artifacts are placed on rock beds serving as pedestals, some of them being engraved with runic symbols reminding of the dialect of the ancient Vinca culture that had ruled over the Balkans about 6,000 years ago. The concentration of negative ions inside Ravne labyrinth is tens of times higher than usual, purifying the air of viruses, bacteria and other adulterants. Negative ions have a positive impact on ones health, especially in mood, breathing and stress reduction. Ravne tunnel also shields the body from exterior radiation, so one of the hypothesis that have been put forward picture this place as healing grounds, or maybe a small branch of a wider facility used for regeneration and protection. 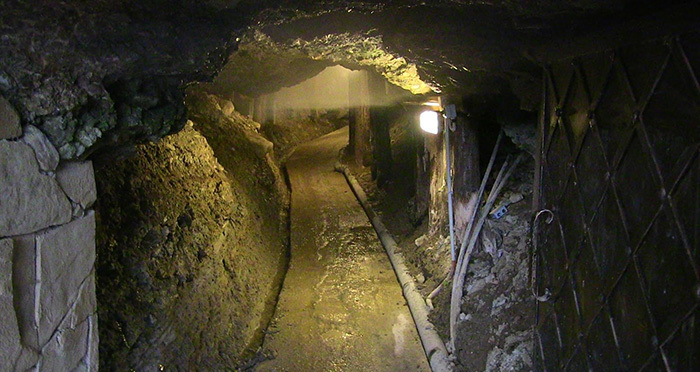 Some researchers believe the complex of tunnels was used as a mine during the middle ages, but there are no relevant resources such as gold, silver or glass to be extracted from there, thus debunking this theory. The only materials unearthed so far are conglomerate, sandstone, quartz crystals and clay, those having more relevance in the pyramid equation, as all the aforementioned materials are present in different layers of the construction. Take for example the concrete on the pyramid of the sun obtained by mixing conglomerate with clay which binds the mixture together. 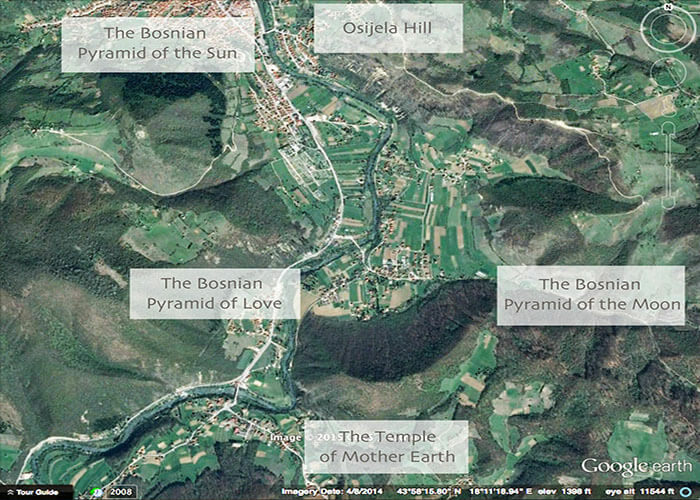 Various digs have been performed on the sides of the Bosnian ‘Sun pyramid’ because of its colossal dimensions. Huge slabs of artificial concrete were piled together, forming a solid shell that seemed to stretch all the way to the top. Volunteers were still removing the layers of soft clay and sandstone, as well as the vegetation growing over. The inclination of the huge concrete plates gave the exact feeling of a pyramid. Their artificial nature looked unquestionable, and the materials used in the conception seemed all gathered from within the Ravne labyrinth. With this in mind, it’s no wonder that researchers working on this project suspect the tunnel leads directly underneath the tallest pyramid. Facing Visočica hill is the ‘Pyramid of the Moon’ with its perfectly aligned 45 degrees edges forming a veritable triangle. Although this structure is pictured as a stepped pyramid, it’s much more to it than meets the eye. As we climb from the bottom to the top of the pyramid, several anomalies take shape. The first one is the inclination of its stone/clay blocks, which are leaned inwards into the body of the structure, exactly the opposite compared to the rest of the sites. This hints at a totally different shape and purpose. 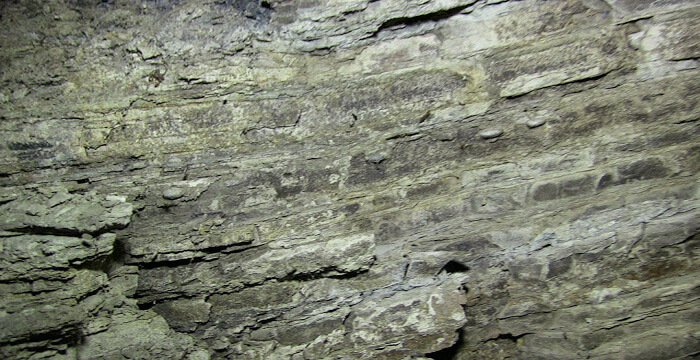 The texturing on the blocks is unique, as if some tools were used on its surface for some unknown reason. You can only find this pattern on plates crumbling from the body of Osijela hill. Follow this link for more detailed pics of this site. Another particularity is the way the terraces (composed of these textured blocks) were built. They seem to curve as they reach the outermost edge of the pyramid, then go up in an apparent spiral, so the terraces appear to spiral up all the way to the top. Another strange particularity is that terraces are becoming bigger and more consistent as they reach the top, as if the entire structure is standing on its head, with its base inverted. On the right side of the pyramid lies another mysterious structure that seems to have been designed by the same builders. 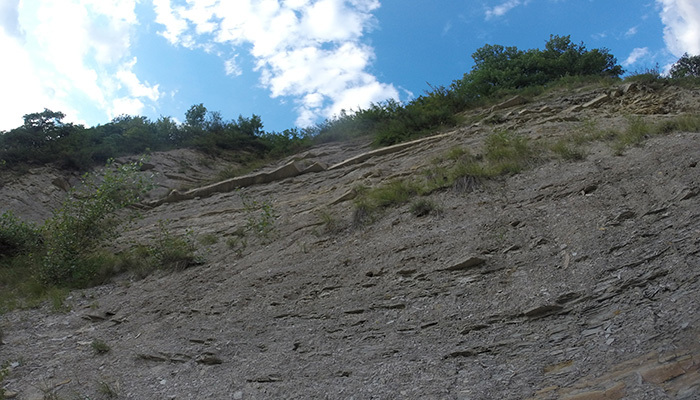 Osijela Hill would pass as a simple, natural mound if not for the side joining the Bosna river that had collapsed and revealed its former appearance. 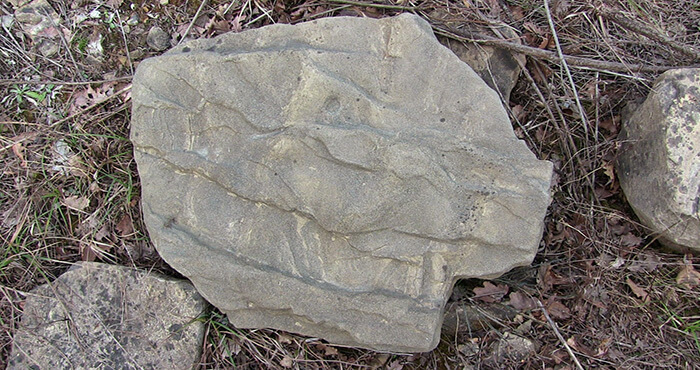 Jotting out of the facet are huge blocks of stone (sandstone or clay) covered by thin layers of material. This process is repeated from the base of the structure, and all the way to the top, where thin, straight layers of clay are stacked on top of each other, before meeting the bigger slabs (also straight) which are then covered by other thin sheets of material. If natural processes were to blame for this, I wouldn’t expect seeing the huge slabs made of an extremely durable material. Osijela Hill is believed to have been a prehistoric quarry from where the ancients had extracted clay and other materials used in the construction of the pyramids and other structures from the valley. The thing which directly contradicts this hypothesis is the texturing present on the stones crumbling from its facet, believed to be unique and only belong to the terraces on the Pyramid of the Moon. As you can see, there is no big difference, if at all, between the stones found at both sites, proving that Osijela Hill was more than a quarry and directly tying it to the moon pyramid. Follow this link to see more detailed pics from the site. he accepted hypothesis is that what we see on these stones are not the markings of the ancients, but rather recent models made by the gypsies of Visoko. This comes hard to believe, since textured stones are periodically falling from Osijela Hill’s facet, from beneath the layers of stone (clay and sandstone) which are undeniably ancient. A tall chimney inside the courtyard of an abandoned leather factory marks the entrance to another off-tour attraction of Visoko. 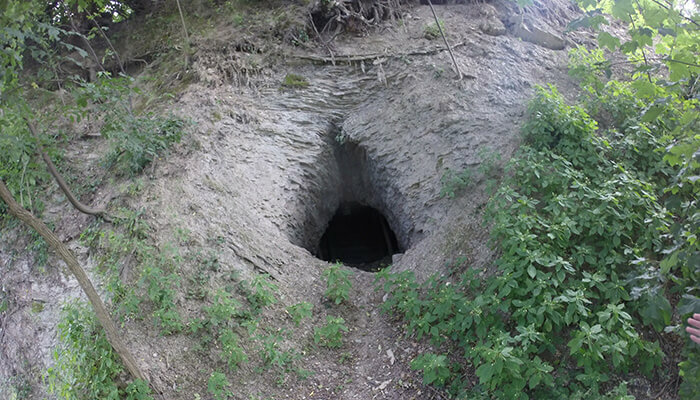 Close to the river’s edge, on a small cliff of dirt, an unusual tunnel entrance points the way to yet another example of ancient ingenuity. The underground passageway is completely distinct than the Ravne tunnel, with a much more ancient feeling. Its interior is designed the same way as the rest of the structures of interest, with the same layering of soft clay meeting hard bricks and repeating the process. As you enter, you see sheets of clay inclined inwards coming from both ways and meeting in the middle a flat surface. Upon entering the tunnel, you’ll notice a flat ceiling made of one huge block which curiously curves and stretches for the entire length of the gallery. There are more side tunnels inside, some with a dead end, and others continuing downwards until they become submerged. A wooden scaffold built by the Archaeological Park Foundation is holding the place from further breaking down, and is allowing safe passage into the rest of the galleries. 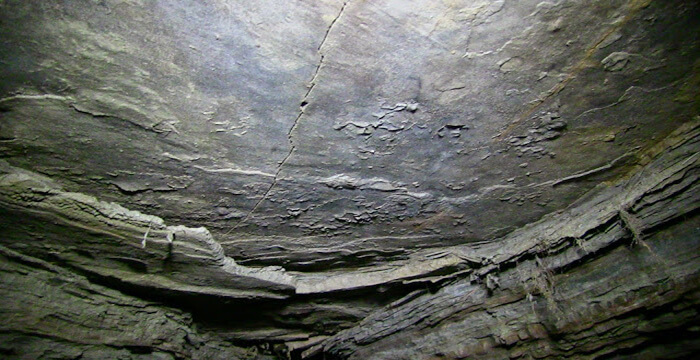 No vegetation is present inside, no bones of animals that could have taken refuge inside were found, only mold growing on the most humid sections of the walls can be observed, as well as traces of stalagmites in the making. There’s a strange feeling to this place, an unusual vibration that’s keeping it quiet and undisturbed. It’s so different than Ravne labyrinth, yet so similar to the megalithic structures of the valley. Theories say the KTK tunnel is directly linked to one of the pyramids, and it’s no wonder why. If they’ll start digging, who knows what they’ll find trapped inside those galleries? 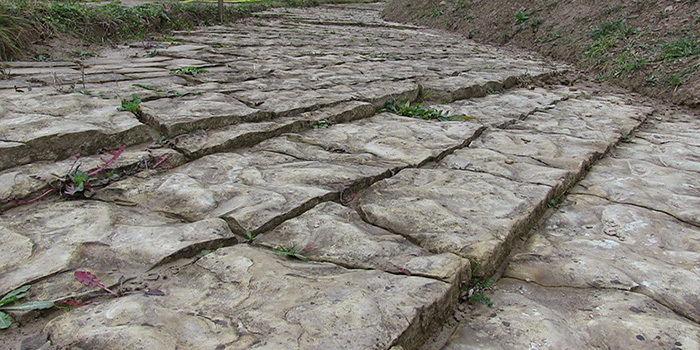 If someone deliberately covered the entrances thousands of years ago, it could mean that something extremely valuable is still contained within the pyramid complex in Bosnia. If it’s gold, or some advanced piece of technology, we can only speculate, but time will be the one revealing what is hidden under there and, of course, the rows of determined and hardworking volunteers. Many aspects regarding the nature, materials used, shape and time frame of the Bosnian sites are still being debated, but if one comes and sees with his/her own eyes what is found there, the shadow of doubt that had been cast by the naysayers will undoubtedly be lifted. Now that the pieces of the puzzle are spread across the table, it’s up to he open-minded people to piece the main picture together. This archaeological project is one of the most active on the planet. It is literally history in the making, and the fun part is that everyone is welcome to participate in it. Will you be coming next year? Find out more about these ancient structures from this documentary, or this book written by Dr. Semir Osmanagich, the discoverer of the pyramids.